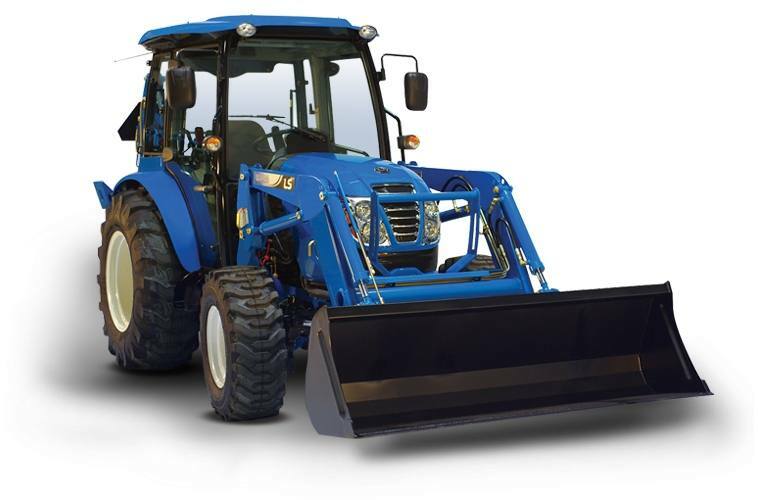 35HP, 40HP, 45HP, 50HP and 55HP medium to heavy duty premium 4WD compacts that come fully-featured as open station or cab with unmatched comfort. Roomy Cab with AC/Heat: Comes standard with side mirrors, front washer/wiper, interior lighting, air conditioning and heat, flat platform and rubber mat. 4WD (Front Wheel Mechanical Assist): Go from 2WD to 4WD with a simple move of a lever. Standard 12x12 Synchro Shuttle: Change gears without having to stop. 12 forward / 12 reverse gear transmission provides more operating speeds than others in its class for superior control, precision and safe operations for virtually any application. Standard 2 Sets of Remote Valves with Detent: Adds functionality and improves ease of use by allowing attachment of hydraulically controlled implements without the high, additional costs like others in its class to add the remotes as options. Side Mounted Main Gear Lever: Maximizes space and makes getting on and off tractor easier than straddle type like other brands. Extendable Lower Links: Allows easier attachment of a wide variety of Category 1 implements with a 1,808 lb lift capacity. Your Choice of Tires at No Additional Cost*: Choose Ag, Industrial or Turf tires are no additional cost. *Subject to dealer inventory. Standard Hydraulic Position and Draft Control: Easily accessible for maximum comfort and convenience. Standard Rear Work Light: Adjustable light to improve visibility where you need it. 7 Pin Connector: Provides electrical Power for implements when needed. LS CRDI Tier 4 Engine: Generates more power with less noise, fuel consumption, vibration and emissions. Standard preheat starting aid helps starting in cold weather. Includes engine speed cruise control. Easy Open One-Piece Hood: Provides accessibility for easy maintenance. Deluxe Adjustable Seat with Arm Rests and Retractable Seat Belt: Keeps you in a comfortable and safe position for maximum control.